Guides, gear, instruction, and lunch is included in price. Are you ready for the adventure of a lifetime! 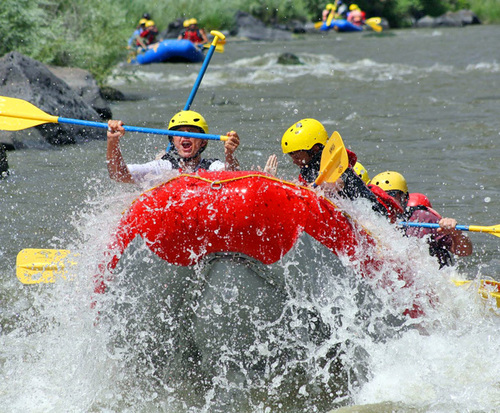 Then you next stop is Taos Box Wild Whitewater in Sante Fe, New Mexico. As you ride the roaring waves you will take in the beautiful splendor of northern New Mexico and the world-famous Rio Bravo. You will experience a 17-mile roller coaster ride of thrills. Some of the rapids you will face are called Ski Jump, Dead Car and Powerline Falls. You will be physically challenged beyond anything you have ever encountered on vacation. You will be left with a grand accomplishment and the memories of your life. Imagine yourself on the rapids. Your mouth gapes open at the sheer beauty of your surroundings. The river has a mind of its own as you are calmly rocked back and forth by its rhythm. You paddle a few strokes as told by your expert guide. Suddenly your calm ride gets faster, so you paddle some more. 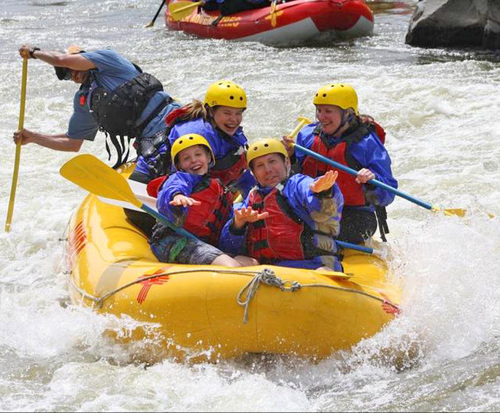 Then rapids start faster and faster, you hold on to the side of the raft. 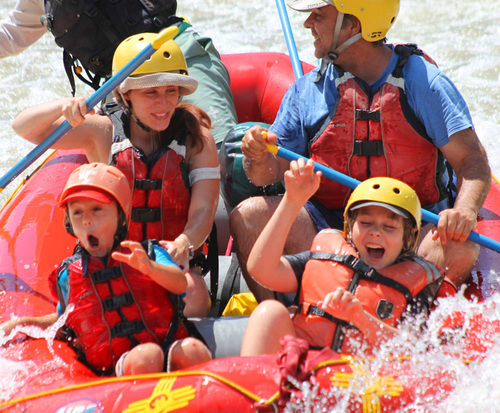 An excited sound exits your mouth as the raft is buffeted wildly along the river. You feel twists and turns unlike any roller coaster built by human hands. Then before you know it, its over as you reach your final destination, Sunset Rapid. You hoist your paddle into the air and cry out a joyful sound. You'll see an area untouched since the Native Americans settled the land thousands of years ago. Watch a bald eagle soar over the mountaintops looking for prey. Your day will include a fresh and delicious buffet lunch. You will have the adventure of a lifetime so come prepared for a thrill.